I like black nail polish. Hmm ... I actually like dark to almost black nail polishes! Black is regal and it makes my hands and feet look whiter with dark nail polish. But sometimes, plain polishes is boring. We use glitters and nail art to spice our nails. Today, I colored my nails black. 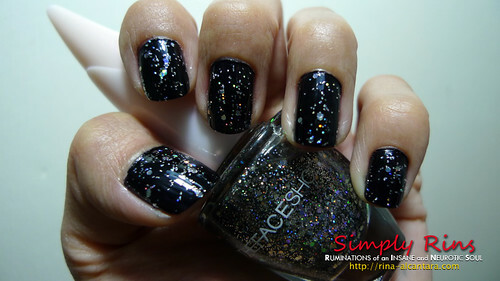 This is 2 coats of Faceshop's Black Nail Color (BK901). No top coat yet. I applied 2 coats of Faceshop's Black Nail Pleasure (BK901). Yes, same code. I really don't know why but that's the code written in the nail polish bottle. Notice that it's not just the usual glitters. There are tiny circles as well. The no. of coats is actually up to you. Sometimes, 1 layer is enough if you'll get the amount of glitters that you want on your nail. This can serve as your top coat. The Faceshop Nail Pleasure can also be used on top of other nail polish colors since it has a clear base. That top coat is gorgeous!